Alfian Sa'at's latest play, which headlines the "In the Spotlight" festival dedicated to his work by W!LD RICE, grabs one's attention almost immediately. It refers to the infamous incident several years ago which involved an altercation between a Singaporean Indian family and an immigrant Chinese family due to the latter complaining about the smell that emanated from the former cooking curry. When reported recently, it led to an outpouring of national resentment against immigrants and their inability to adapt to local culture. Cooking a pot of curry became a metaphor for being able to freely do as one chose in one's own country, a spicy vindication of one's national identity. The play kicks off with a bang by re-creating the mediation session that took place between the families in the curry incident but it's impossible to watch the rest of Curry without being reminded of its more powerful and poignant predecessor, Cooling Off Day. Indeed, the format of Curry is almost identical to Alfian's earlier play: minimalist stage, six actors performing monologues based on interviews with real people, images and statistics flashed on the background. Cooling Off Day, with its exciting verbatim theatre format, took the nation by storm by coming just a few months after the general elections and tapping into a range of questions, musings and grievances about national politics that almost everyone was able to identify with. While Curry is certainly political by focusing on senstive issues of immigration and integration, it simply does not have the same level of urgency. Indeed, the main feeling one gets from watching Curry is a collective sense of anger against foreigners and the viewpoints featured mostly feel biased and repetitive. There are nice plays on words and the occasional interesting voice such as the older immigrant who has completely assmiliated into the Singaporean way of life but for the most part, Curry creates a rather uncomfortable dialectic between upstart immigrants and aggrieved locals who feel crowded out of their own country. We hardly hear the voices of the new immigrants and like the opening scene, they tend to be portrayed in a negative light. The play therefore feels unbalanced and doesn't quite capture the rich spectrum of voices that made Cooling Off Day such a breath of fresh air. The ensemble cast of six are uniformly strong in bringing the various characters to life by simple props and mannerisms. Director Glen Goei does a great job of allowing each actor to pitch their scenes at just the right level to get a laugh or a empathetic round of applause. Neo Swee Lin and Najib Soiman, both cast members from Cooling Off Day, are terribly entertaining as always but there is also very good work by Judee Tan and Rishi Budhrani who show an impressive range in their scenes. Alfian intersperses the play with national day songs with reworked lyrics, allowing him to ironically comment on the themes of the play while providing some comic respite. However, these segments once again drive in the divide between disenfranchised Singaporeans on the one hand and foreigners who are seduced by the wonders of this country on the other. This culminates in a closing sequence where the actors portray foreigners receiving their hallowed red passports as the national anthem is sung. Unsurprisingly, none of the newly minted "citizens" know the lyrics and can only stand there awkwardly as a giant national flag is lowered. It's a great visual to end with but seemed nothing more than a dramatic flourish to underscore a point which had already been beaten to death. 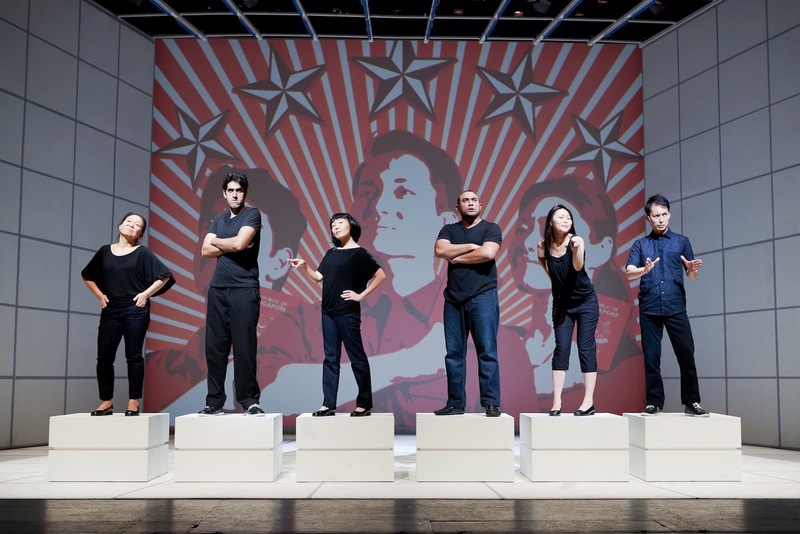 As far as Singapore political theatre goes, Curry is certainly an important play for tackling topical issues that have gripped the public and dissecting them on the stage. Yet, part of me wished that the play had remained in the realm of fiction, perhaps by expanding that terrific opening scene into a full-length play that explored similar themes. By going down the trendy verbatim theatre route and focusing on a relatively limited range of viewpoints, Curry felt too much like an imitation of an award-winning recipe to leave a truly lasting taste in one's mouth.